On November 5th is the 50 years ceremony for Liaoning provincial aeronautic society, in order to making the celebration and strengthening the business relations with international suppliers, the 5th China Aerospace Manufacturing Summit will be held in Shenyang during Nov. 5th–7th, 2014. This event will guide you to the right persons in charge of the right projects and help you to catch up with the latest manufacture, research and development updates of COMAC C919 Aircraft, Z-15 Helicopter, Turboprop Regional Jet in Xi’an and Business Jet in Chengdu and Zhuhai and expansion on assembly line of oversea aircraft OEMs. The forum intends to prompt the major special projects of China’s commercial aircrafts, share insights for latest technology trend, standards, regulations to tackle the new requirements and challenges on aerospace manufacturing and learn deeply about the market demand from verification, testing, airborne system development and other parts of the aerospace supply chain in China. 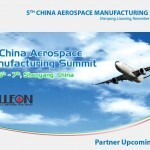 The 5th China Aerospace Manufacturing Summit is the best opportunity for you to update your knowledge and skills, understand the evolution in the industry and prepare for the future.